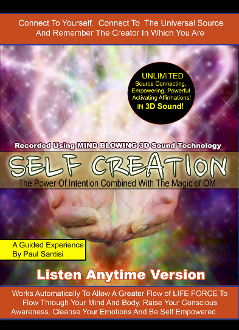 Self Creation Guided Meditation 3D Sound "listen anywhere audio"
may you never be the same >> Self Creation Guided Meditation 3D Sound "listen anywhere audio"
A true masterpiece in self awakening. A magical guided meditation combined with the power of intention, the magic of OM (chant/mantra) The vibration produced by the sound of Om chanting is said to correspond with the original vibration that first arose at the time of creation. Unlimited affirmations that will have you cnnecting to SOURCE ENERGY (collective consciuosness, infinite intelilgence, all knowledge) and activate the creator that we are. Recorded in MIND BLOWING 3D sound. (Must wear headphones to experience 3D sound) Unimited empowering affirmations that work automatically to allow a greater flow of LIFE FORCE to flow thorugh your mind, body and soul. Raise your conscious awareness and energetic vibrations. Cleanse your emotions and become empowered like never before. This audio will be one of the best life experiences of your life!